We loved the TomTom Rider Motorcycle GPS unit so much we have rated it our favourite motorcycle gps unit of all time. Its a great product that comes with a brand name therefore you know that you’re buying something that has been tried and tested for years and will perform for the foreseeable future. The TomTom Rider it's TomTom’s all new motorcycle gps and is there top of the range unit meaning that it comes with all the latest, and best features all that have been designed to help you reach your destination on time whilst driving along the road or highways that you want to whilst riding your motorcycle. The TomTom Rider comes with a super high resolution 4.3 inch screen that is not only glove friendly meaning that you can wear your gloves whilst using the unit, but it also comes with TomTom’s sunlight protection which helps to protect your screen from harmful UV lights, but also allows you to read the directions on your GPS unit even when in direct sunlight. The unit is made from solid plastic is is fully waterproof meaning that you can use it in the rain. To use your GPS unit, simply switch it on, and TomTom simple interface system brings up all the features that you could possibly want to get you to your destination. Once you have decided where to go, simply bring up the menu and enter your destination using the touchscreen and full QWERTY keyboard. The predictive text helps to make this process quicker meaning that you can choose your location and the inbuilt computer can calculate your route based on whether you want the most direct route, or a route than does not use highways. Directions are fantastic and the unit gives you both on screen turn by turn directions, and if you have connected your bluetooth headset, voice directions through your helmet. Maps are very detailed and the gps unit comes preloaded with maps of the US and Canada and free lifetime map updates to ensure that your maps are kept updated throughout the year. Battery life is very good and easily you can have 5 hour of battery life, however as an added benefit, you can also wire your GPS unit directly into your bikes battery to ensure that you never have a problem with battery life. The fitting kit is provided when you buy your unit, however we would recommend that you use a professional to install it as it is quite complicated to ensure it works properly. 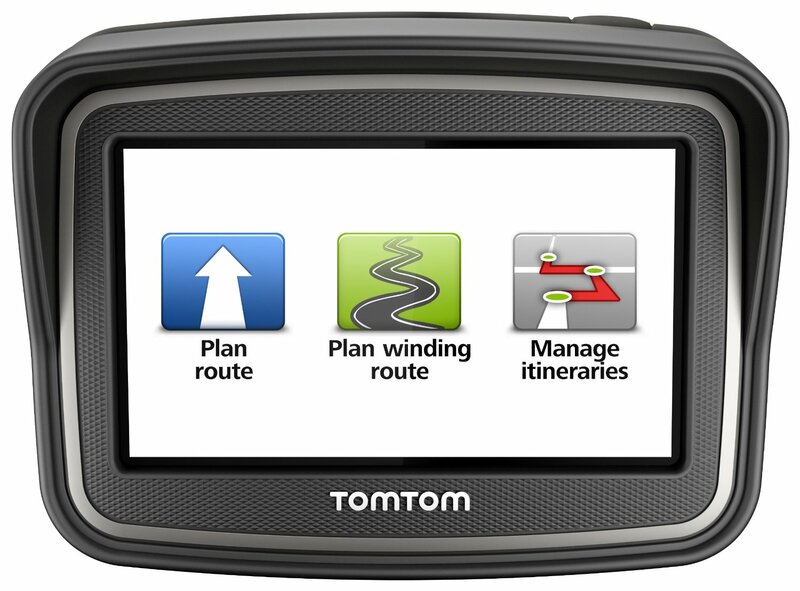 Overall we love the TomTom rider and think its the best motorcycle GPS unit on the market today. Its performs well and has made our lives easier since its release, however there are some drawbacks with buying the TomTom Rider GPS unit most notably that it does not comes with a mount meaning that you have to buy this separate. This is not a big deal given that often the mounts that these GPS units come with are never very good, but we feel that it really should come with a mount as standard.